If your daughter or grand-daughter loves horses and ponies, and you are on the East Coast, you MUST take her to Chincoteague Island, Virginia! 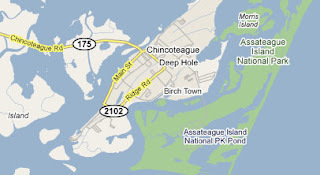 Chincoteague Island is a barrier Island located just off the coast of Northern Virgina, with Asseteague Island just a short 100 feet beyond it. The legend goes that a 16th Century Spanish Ship, traveling to the new world, ran ashore in the stormy, shallow sea. The horses in its cargo-hold were then left to fend for themselves. 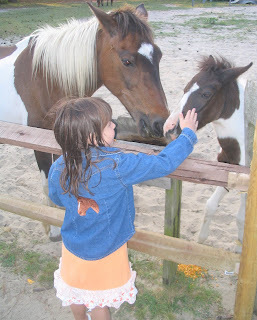 Many of the ponies managed to find their way to dry ground, evolve to their new surroundings on Asseteuge Island, and create generations of "Chincoteague Ponies". Today, Asseteague Island is a National Wildlife Refuge and remains home to the free roaming Chincoteague Ponies. 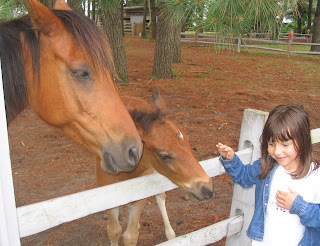 Chincoteague Island provides access to Asseteague island, and is a horse lover's delight! Make certain your Horse Lover will see ponies on your trip! While you can drive, bike, and hike through Asseteuge, or take a guided boat door around the perimeter, you will most likely only see pony herds in the distance. Hopefully, you will get lucky and see a few up close! Of course, those of us with young horse lovers in our lives know that is not enough! No worries, though! To ensure your daughter gets plenty of face time with plenty of ponies, choose a hotel with their own Chincoteague Ponies on site! We always stay at the Refuge Inn - requesting a Ground floor room on the "Pony Side". The Refuge Inn keeps several mares penned in a large area running parallel to the Eastern side of the hotel. They sell feed for 50 cents a bag. Plus, if you go during May or June - there will probably be BABIES too. Each morning, our daughter jumped out of bed and pulled back the drapes to "See the Ponies". Here she is feeding them and patting them! She was 5 on our last trip, and we felt comfortable allowing her to go out the sliding glass door of our room, and walk across the narrow parking lot to see the ponies. With the ponies right next to our room - we visited with them many times each day. It truely makes the trip! PS... Ill report again with more Chincoteague activities for horse lovers! PPS... You can also enjoy an amazing stretch of non-commercialized seashore on Assetegue, so be sure to bring your beach gear.